I’ve decided my one legacy to the world is the phrase, “Bad government policy begets more bad government policy.” This term, which I am modestly calling Mitchell’s Law, describes what happens when government intervention (Fannie and Freddie, for example, or Medicare and Medicaid) causes problems in a particular market (a housing bubble or a third-party payer crisis), which leads the politicians to impose more misguided intervention (bailouts or Obamacare). Here’s a good example from Germany. The politicians created government-run healthcare. Overweight people are putting a larger burden on the system, imposing costs on taxpayers. The logical response is to shift to a market-based system where people are in charge of their own healthcare costs. Not surprisingly, that option isn’t being considered. Instead, politicians are using the situation as an excuse to consider even more taxes. Marco Wanderwitz, a conservative member of parliament for the German state of Saxony, said it is unfair and unsustainable for the taxpayer to carry the entire cost of treating obesity-related illnesses in the public health system. “I think that it would be sensible if those who deliberately lead unhealthy lives would be held financially accountable for that,” Wanderwitz said, according to Reuters. Germany, famed for its beer, pork and chocolates, is one of the fattest countries in Europe. Twenty-one percent of German adults were obese in 2007, and the German newspaper Bild estimates that the cost of treating obesity-related illnesses is about 17 billion euro, or $21.7 billion, a year. …Health economist Jurgen Wasem called for Germany to tackle the problem of fattening snacks in order to raise money and reduce obesity. “One should, as with tobacco, tax the purchase of unhealthy consumer goods at a higher rate and partly maintain the health system,” Wasem said, according to Germany’s English-language newspaper The Local. “That applies to alcohol, chocolate or risky sporting equipment such as hang-gliders.” Others are suggesting even more extreme measures. The German teachers association recently called for school kids to be weighed each day, The Daily Telegraph said. The fat kids could then be reported to social services, who could send them to health clinics. Personally I would call that “Reagan’s Law.” Reagan said many things espousing that sentiment, too many to list, though some popular examples are “government is not the solution to our problem, government is the problem,” and “the ten most dangerous words in the English language are ‘hi, I’m from the government, and I’m here to help. '” The only problem is that the rule may fail to encompass the man’s sheer scope. I have a favorite example of this principle related to me by my parents from their native land of Holland, where a bizarrely conceived (no pun intended) program of total compensation for single mothers intended to enable them to raise their children full-time resulted in, among other extremely obvious problems, a severe drop in the amount of married couples. The government suspected, very rightly of course, that child-raising couples were simply forgoing the formality of marriage which would have disqualified them from the stipend. The government’s solution was a series of aggressive investigations, which did exactly what you’d suspect; which is to say, it broke up the parents for real, thus transforming the once-expedient illusion of countless fatherless children into a tragic reality. This happened a few decades ago, and for obvious reasons Holland is now among Europe’s more conservative nations; this was additionally helped along by a massive influx of Muslim immigrants, and particularly ignorant and violent ones at that, even by the standards of their native country. I read the phrase “those who deliberately lead unhealthy lives” and my blood boils. Why is it believed that those who are obese are not following the best advice of the so-called experts on diet? Does no one recognize that obesity has increased with the official advice to decrease fat in the diet and increase grains? Don’t fault those who develop health problems by following the advice of health experts. 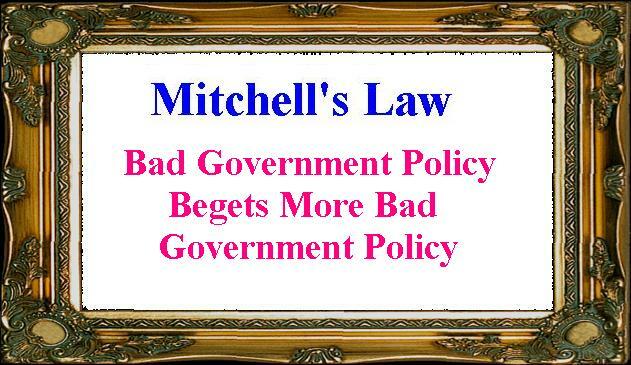 Mitchell’s Law? Apparently Ludwig von Mises once said “Government intervention always breeds economic dislocations that necessitate more government intervention.” Unfortunately, I don’t have the source for that quote, though I can believe he said it.